I was chatting with Karrita the other day ( Mymothersgarden.etsy.com ) and said I didn't really have a garden, it was mostly gravel. 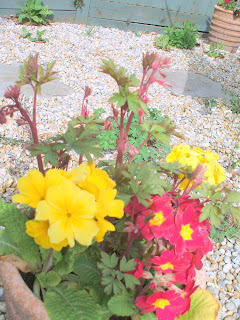 Afterwards, I thought "Eeek, I hope the garden didn't hear me!" Because actually, I love my garden. 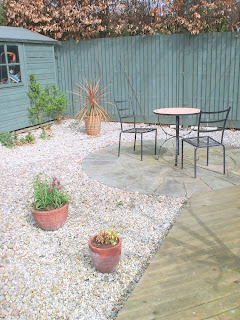 It is mostly gravel on purpose, because my hay fever has been a lot easier to bear without a lawn to cut! We have quite a few pots with various plants in (no, don't ask me to name them) and I've also broadcast handfulls of seed, and allowed plants to self seed where they will. We have lots of aquilegia and foxgloves coming up. I know these ones (above)! They're snakeshead fritillaries, and look lovely fluttering about in the breeze. 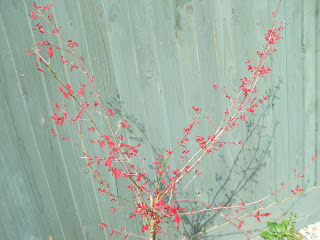 And this is a little acer, chosen to contrast with the smoky blue grey fence. Last but not least, I love my pond, where the tadpoles are growing bigger every day. 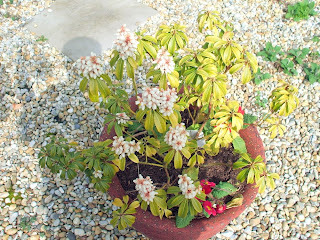 Visit MymothersGardens.blogspot.com for her 'Artists in the Garden' interview series. click here to enter my competition to win your own meerkat! I love your garden! It must be lovely to sit in it and just relax. We live in a flat but do have a shared garden but I would love garden of our very own. One day. Thank you :-) It'd be even more relaxing if the kids over the back didn't have one of those giant trampolines ;-) Don't worry, I'm not *really* gong to complain about kids playing! We had more than enough grumpy neighbours when our own kids were young. I love your garden! I'm jealous. I just bought a new house and mine needs so much work. I love your garden!! I think you do owe it an apology!! especially the pond. It must be so cool to watch the tadpoles turn into frogs. I see you get to grow the primrose flower. It's one of my all time favorites,(I'm unable to grow it here in my tropical climate) I love the bright color contrasts in the blossoms. I really like gravel gardens with tubs - and yours looks so beautifully calm and balanced. Amazing garden so exotic and tranquil! I really like your garden. It looks peaceful and relaxing. 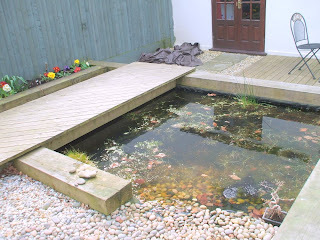 What a beautiful garden, how luck to have a little pond too! A great place to go and think!! Wow, your garden looks so pretty and tranquil. 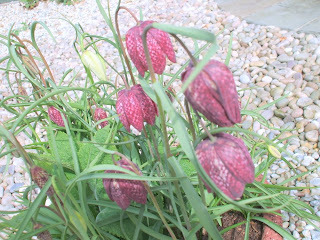 Your fritillaries are beautiful. Graffiti - I love it! Well it's not a sheep! Look what the postman just delivered! I've been invited to audition for X Factor! Meerkat mania - yours for free!